In the 1950s, plastic sandals (known as flips flops in America, jandals in New Zealand, thongs in Australia, slops in South Africa etc) became popular around the globe. Modeled after Japanese sandals known as zoris, some of the first plastic sandals did come from Japan but the savvy exporters in Hong Kong played a critical role in popularizing the low-cost convenient footwear in the global market. Below are the profiles of the British trading firm John Cowie & Co and the Chinese manufacturer Nylex which left their marks in this business. H.J. 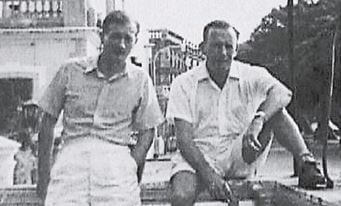 Cowie and New Zealand importer Morris Yock in HK in 1955. John Cowie & Co was a major trading house which played a key role in the post-WWII industrial development of HK (especially in the field of plastics and toys) under the leadership of two dynamic individuals – its founder Henry John Cowie (hereafter refer to as H.J.) and his successor Anne Cornelis Willem “Bill” Blaauw (1922-1997). The firm was founded in 1950 by three British nationals in Hong Kong – H.J. Cowie, A.T. Simmons and N.R. Ramsey. H.J. was born in 1909 in Darjeeling, India, a third-generation British colonist in the Indian subcontinent. His grandfather, the Oxford-trained Henry George Cowie served in the Indian Financial Department for three decades and was Deputy Comptroller General to the Government of India from 1893-96. His father Henry Edward Colvin Cowie served with the Royal Engineers in India and the China Expedition Force from 1900-03. H.J. went to his father’s alma mater in the UK – Shrewsbury School and received his M.A. from Lincoln College at Oxford University in 1932. Upon graduation, he joined Butterfield & Swire where he worked until 1940. During WWII, Cowie was a Major with the Indian Armoured Corps (5th Probyn’s Horse). In 1944, Cowie led a BAAG demolition mission which demolished all road bridges 40 miles Northeast of Kweilin, and thus successfully delayed the Japanese Army’s advance for weeks and allowed Allied Air Forces sufficient time to evacuate from Kweilin and Liuchow with minimum loss. Sir Lindsey Ride, head of the BAAG, reported that Cowie’s operation “was the most important British military operation in South China and that it was directly responsible for the restoration of British prestige in the Chinese eyes. Major Cowie’s distinguished services in this operation undoubtedly played a large part in attaining this end.” Later Cowie also led his party to safety during a sudden attack by the Japanese during their evacuation to Kunming and served as the sole British representative in Canton attending to British internees in August 1945. 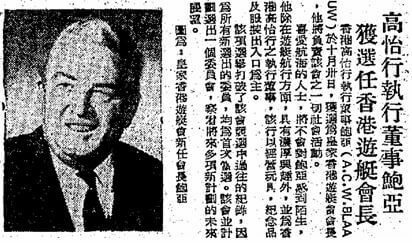 For his wartime contributions, he was awarded the MBE and like many enterprising veterans of BAAG, he moved to HK to participate in the post War economic miracle by starting John Cowie & Co. The firm’s initial business was in trading of pharmaceuticals, chemicals, piece goods, yarn and metals but it did not take long before the firm became involved in the emerging field of plastic. Inspired by sandals he saw in Japan, Cowie began shipping rubber and plastic sandals from HK to all over the world, except for New Zealand where import laws were strict. After a visit to Cowie’s factory in HK in 1955, Morris Yock, an importer from Auckland bought machines and molds to make the plastic sandals back home and trademarked the term “Jandals” (as in Japanese sandals), which is what the popular sandals became known as in New Zealand. In 1959, H.J. Cowie decided to move to New Zealand with his family and sold John Cowie to the trading house Blair & Co, which was itself acquired in 1957 by the Hutchison group that was growing at a rapid pace through acquisitions and organically under the leadership of Sir Douglas Clague, a fellow BAAG veteran. Taking over at the helm of Cowie was a Dutchman by the name of Bill Blaauw, who joined Blair in 1950 from Royal Interocean Line. Born in Samaden, Switzerland to a Dutch diplomat, Blaauw arrived in HK in 1948 and had a very international outlook. Under Blaauw, the firm acted as buying agent for a variety of lucrative trades of the era such as artificial flowers, giftware and wigs but the main business was toys. He created the HK Toy & Gift Fair in 1974 which became the biggest in Asia and now split into two separate events. For his effort in putting the HK toy industry on the map, he earned the nickname “Mr. Toys” and “doyen of the HK toy industry”. The quintessential salesperson, he was chairman of the HK Exporters Association and the Sales & Marketing Executive Club. Outside of work, Blaauw was an avid sailor who had served as chairman of HK Yacht Club and commodore of the Aberdeen Boat Club and was also big in horseracing circles. Working closely with Blaauw at Cowie in the 1960s was company director C.T. Mok (莫昌德 1926-), a graduate of King’s College. In the early 1980s, Blaauw left Cowie to start his own toy export/import firm – Meco Development and served on the board of Playmates, best known for its Teenage Mutant Ninja Turtles toy franchise. He ran unsuccessfully in the first Legco election in 1985 and passed away on Boxing Day in 1997. In the 1950s and 60s, Nylex Plastics Ltd (力士塑膠) was the largest manufacturer of plastic sandals and shoes in Hong Kong under its NYLEX brand. The firm was incorporated in 1959 but was founded earlier by Lai Wah-shing (黎華成, original name Lai Sing-kau 黎勝球,1915-1975), who started making plastic footwear with his older brothers (Lai Wah-shing rank number 8 among his siblings) in Canton before the War. Lai often traveled to Japan and Europe to study the latest developments in plastics in order to keep Nylex on the cutting edge. In 1956, Nylex’s office was located at Commercial House in 35 Queen’s Road Central and its plant was located at 3 Keswick Street in Causeway Bay (now Keswick Court – built 1988). The plant had over 100 plastic molding machines churning out over 10000 pounds of plastic products per day. The firm had its own machinery department which could fabricate spare parts and fix the machines. Aside from sandals, the firm also manufactured other plastic products such as multicolor and translucent plastic bags. Only 20 percent of its outputs were sold domestically while 80 percent were exported to UK, Australia, Southeast Asia, Middle East and Africa. (A 1971 lawsuit between Nylex and the Indian trading firm Raneyco involving 12000 dozens PVC shoes being shipped to Somalia, highlights the far reach of the firm) In 1957, Lai Wah-shing was one of the founders of the HK Plastic Manufacturers Association alongside Chieng Han-chow of China Plastic, Norman Young of Yuen Hing Hong and J.H. Leung of Star Industrial (Red A brand). By the early 1960s, Nylex added its own Nylex Building at 11 Hoi Kwong Street in Quarry Bay (re-developed into Hon Way Mansion in 1990). In 1963, the firm launched a new series of plastic sandals and sneakers which featured plastic soles with non-plastic materials such as canvas, cloth and felt and it was doing so well that the shoes at its booth at the HK Products Expo were only for display not for sale. The profits from plastic enabled Lai Wah-shing to acquire the popular Goldfish Restaurant (金魚酒家, founded in 1950) at 16 Pennington Street in Causeway Bay in 1964 from the famous restauranteur Stanley Wong (1912-1985). Goldfish was renowned for its Cantonese cuisine (especially dim sum) and today various food critics and chefs still write fondly about the now defunct restaurant’s dishes. At Nylex, Lai Wah-shing was supported by his second son Lai Kwong-tung (黎廣桐) and his four nephews (in order of age)- Lai Sek-nang (黎錫能), Lai Sik-Peau (黎錫標), Lai Sek-kai (黎錫佳) and Lai Sek-kin (黎錫堅). Sek-kin who was senior engineer at the firm was an engineering grad from Japan and was sent to Europe to study the plastic industry there in 1962. In 1974, Nylex Realty completed Conwell Mansion on Wharf Road in North Point. In 1975, Wah-shing passed away in San Francisco at the age of 60 and was survived by 5 sons and 2 daughters. His oldest nephew Sek-nang succeeded him as chairman of Nylex Realty. Outside of business, Sek-nang is a major collector of Chinese paintings, especially modern paintings by the artists of the Lingnan School and actually knew some of the Lingnan masters such as Zhu Qizhan (朱屺瞻 1892-1996) and Cheng Shifa (程十髪, 1921-2007) personally. By 1982, Lai Kwong-tung, who has served on the HKPMA since the 1970s, had taken over as chairman of Nylex Realty. At the time the firm held six properties in HK island – 102-122 Wharf Road in Quarry Bay, 11 Hai Kwong Street in North Point, 41 Shouson Hill Road (Pak Villa) and 16 Pennington Street in Causeway Bay (which was being re-developed), 6 Fung Fai Terrace and 27-29 Wing Lok Street. In 1987, Chinney Investments acquired Nylex Realty at $5.78 per share or a total cost of HK$93 million. This article was first posted on 29th September 2017.